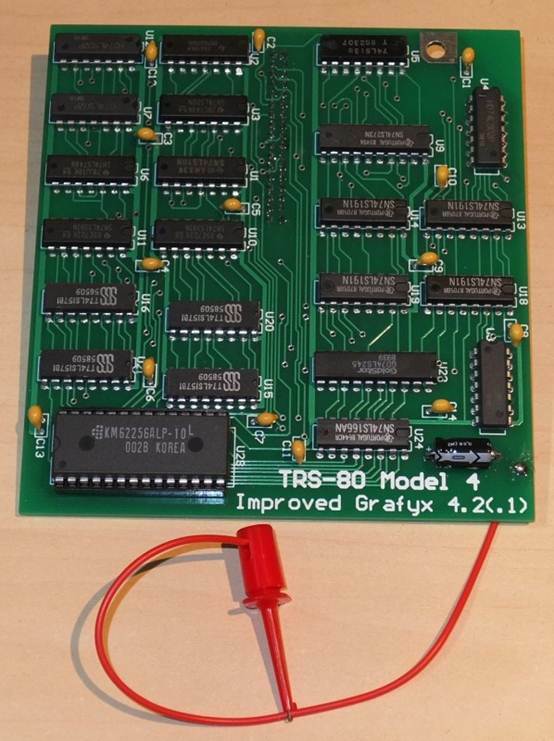 Ian Mavric has developed a High-Res Graphics board for the TRS-80 Model 4/4GA/4D. It is compatible with the microlabs GX 4.2 board and can be ordered for the cost of $179.99 plus shipping. Question: I see this new graphics board has a 32K byte SRAM, the 62256ALP-10. It is stated to be MicroLabs compatible. The uLab board only had 20 KB of SRAM. But the Radio Shack board had 32K of DRAM. So this brings to mind some questions: 1) is only 20 KB of this new board accessible, as on the uLabs board ? 2) if the full 32K is accessible, is this implemented as on the Radio Shack board ? To refresh our memories, recall that the Radio Shack board’s 32K RAM was organized as 128 bytes per horizontal rows, with 256 rows in total. Hence 128 bytes/row * 256 rows = 32 KB DRAM. Yes? uLabs SRAM was organized as 80 bytes/row * 256 rows = 20 KB SRAM. Yes? Just checking…my memory is a little hazy going 30+ years back!